eM Client provides a way to connect all of your Facebook calendars and display them with your standard calendar in a familiar interface. 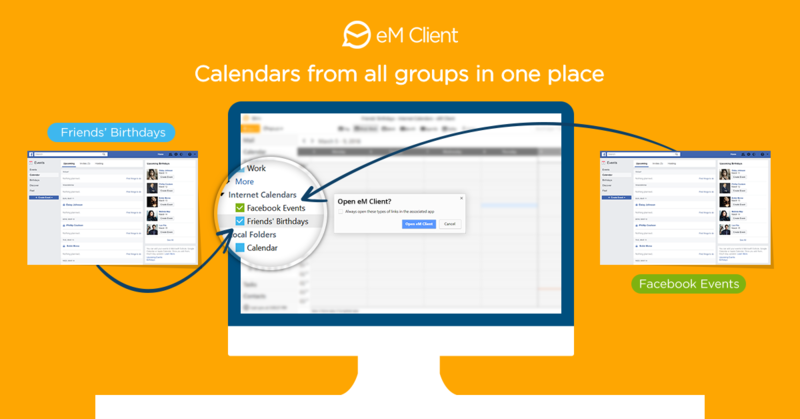 eM Client provides a way to connect all of your Facebook calendars and display them with your standard calendar in a familiar interface. So you will never miss a thing and planning will be much more effective. Whether it is your friends’ birthdays or events of your business Facebook page, you can add all the calendars with just a few clicks. All you need to do is open Facebook with internet browser of your choice, open Events - Calendar section and click “Upcoming events” in the bottom right corner of the screen. The site should ask you whether you want to open the link with eM Client which will automatically add your calendar. If you want to add only your friends’ Birthdays, select "Birthdays" instead of "Upcoming events" in the same section. With two clicks, you can add all birthdays of your Facebook friends to eM Client and never miss any of them again (if you work with eM Client every day :) ). In eM Client you can find these calendars and birthdays under the "Internet Calendars" section, which is displayed in the left panel among your standard calendars.